Are these a limited run or distributor exclusive? Don’t see that many, been looking for one locally. I do not think they are dealer exclusive. I think it is just taking time to get a decent supply to dealers. On a defensive carry forum I participate in people are reporting they are finding them at a LGS. It is a relatively new gun and it will take time to get them onto the market. So this morning I made a run to the range (indoor) to put a few more rounds through the Smith BG380 (back from spa day at mothership to get slide stop replaced) and the Sig P290RS 380 (after cleaning interior on magazines, one is still misbehaving) and so also took the Remington along as my carry gun. Ran 25 rounds through it with a five spot target set at 5 yards. Shoot one handed weak hand point and shoot, medium rapid fire with one dot as goal for each magazine. Largest grouping I could still cover with my hand, smallest with just my palm. The Remington RM380 is simply amazing, and I keep trying (and failing) to find the flaw or weakness I know has to be there. 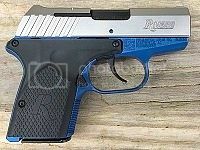 But so far it really has been flawless, enough so that as soon as I got back from the range I ordered one of the new dark blue & stainless slide version from Classic Firearms.